It has been many years since I have ventured outside of my house on Father's Day. Since my dad passed away 17 years ago on Father's Day, it has been a holiday that is filled with anxiety and depression. This year was different though. Usually my hub and kidlets head out to spend the day with FIL. This year I spent the day distracting myself with these little yummies. I used a wet on wet technique with the goal of practicing some straight lines. Then I jumped in the car, accompanying my family to the OC. The ride there was a little stressful, but once I got there and settled in with the fam, everything cleared up. I have such a great time with them and LOVE seeing my nephews play. 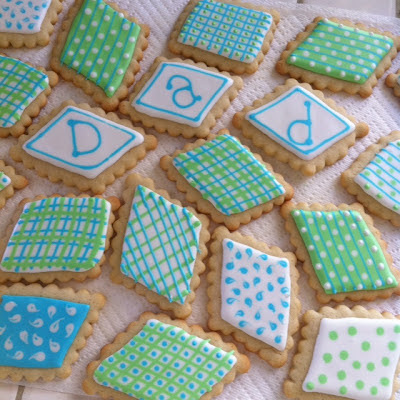 The cookies turned out well too! They were a hit and FIL loved them. Happy Father's Day! Here's to NEW traditions.